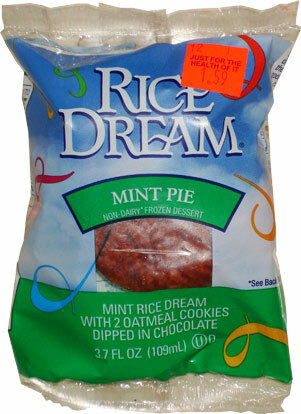 [By Nick] Long ago after my second rice dream pie review, one of my friends whose parents happen to own the health store in town informed me that they also carried the Rice Dream pies in a mint flavor. If memory serves me correctly, she even went as far as to say she “loves them”. Not having the best of luck with these products and semi-terrified to see how the oatmeal cookies would work with the mint rice dream, I put off stopping in their store to pick one up. Well I finally got curious enough to try one of these pies so here we go folks. The product is composed exactly the same as the chocolate pie except instead of the “chocolate” rice dream (I still don’t believe it deserves that name) obviously it is mint rice dream. I really don’t see how oatmeal cookies and mint can even be a reasonable pairing. If I was them, I would’ve swapped the oatmeal cookies out for dark chocolate cookies. 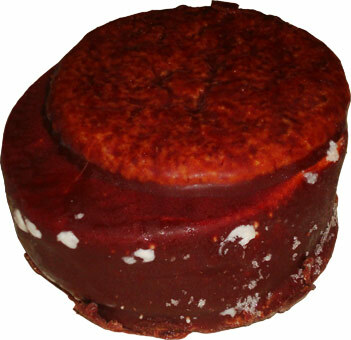 I mean if the coating wasn’t also lacking in chocolate flavor it would work so nicely. I know it sounds like this product is doomed from the start but I do have some hope for it. I mean if one person in the world “loves” these then it can’t be all that bad, right? Out of the wrapper, the appearance is the same as the other two but the smell of mint is pretty potent. I’m not sure if I’m excited about that or not. Cutting it in half, the smell only intensifies. Now I might be a tad bit worried. All I can think of is putting toothpaste into a bowl of oatmeal. I’m also a bit taken aback by how white the rice dream is. It even seemed to be brighter than the vanilla rice dream pie I reviewed. Taking a bite, I have to say I’m impressed. Sure the chocolate coating is essentially just there for show and the oatmeal cookies still aren’t sweet enough but the mint rice dream seems to cover up their flaws. The mint flavor is potent just like the smell but by no means overbearing. It’s a very clean taste; I would go as far as to say refreshing. Its potency is what makes this one good to be honest. It helps to distract you from the subpar coating and cookies. I’m still shocked by how the texture of the rice dream mimics that of regular ice cream in similar applications. It’s not exactly creamy per say but it is very dense and I appreciate that. 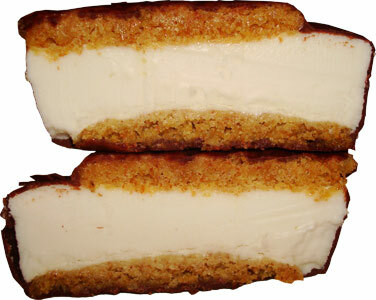 I wouldn’t go as far as to say I loved this treat but I can finally say I found a rice dream pie that I actually like. I didn’t think that would be possible to be honest. Now time to go hunt down the only flavor I haven’t tried: mocha.